Ford announced the opening of its new Ford Technical Support Center in Concord, N.C. today. The state-of-the-art facility will add an array of tools to develop future performance vehicles and help increase Ford’s overall success in motorsports. Expected to be fully operational later this summer, the 33,000-square-foot building will serve as a center for Ford Racing technical support and for teams to develop and test their cars for competition. The location was selected because of its proximity to the NASCAR research and development center and a majority of race car team headquarters. “Motorsports and product development at Ford are interlinked, and this new center will house advanced tools that will serve both our race teams and the development of future Ford performance vehicles,” said Raj Nair, group vice president, Ford global product development. Beyond its direct and immediate effect on Ford Racing, the new technical center with its advanced simulation and measurement tools is just the latest investment by Ford in its pursuit to offer a profitable lineup of performance vehicles. The new infrastructure will allow swifter and smarter leverage of the latest in product development technology. Ford offers one of the most complete and accessible lineups of performance vehicles of any full-line manufacturer. From the growing popularity of its Sport-branded models including the EcoBoost® V6-powered Explorer Sport, to the award-winning Fiesta ST and its Focus ST stablemate, Taurus SHO, to the SVT Mustang GT500 and F-150 SVT Raptor, to extreme performance RS derivatives, Ford provides true performance options throughout its model range. Initially, the facility will focus on supporting NASCAR teams in all three major touring divisions, but will eventually expand to include other Ford Racing teams participating in other series. The centerpiece of the building is a full-motion platform simulator that will allow Ford Racing teams to optimize their setups for individual track configurations, and for drivers to practice driving a track ahead of an upcoming race weekend. Similar technology has been used in Formula One. 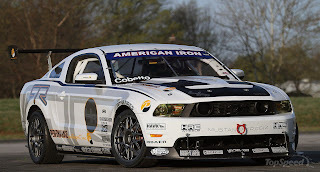 After the simulator has been proven through racing, Ford will apply that knowledge to further improve vehicle dynamics on its high-performance street vehicles. “We have enhanced our vehicle dynamics simulation tools to lead the development of Ford Racing cars in NASCAR and IMSA, as well as our street products,” said Nair. “The driving simulator will help us to push handling optimization to the next level so that our cars can be fast right off the trailer, allowing our teams to focus on fine-tuning changes when they get to the track. “The simulator can also be used to make continual adjustments to advance the car setup for the race weekend based on what the teams see in early practice sessions,” added Nair. In addition, the simulator will help hone communication between driver, crew chief and engineer, while also refining predictability and accuracy of simulation software. This entry was written by by Drew Phillips (Mustangs Daily) and posted here on Thursday, May 15th, 2014 at 1:44 pm and is filed under ford racing, ford racing technical support center, ford technical support center, Motorsports, News. This article was not written by us, rather gathered using RSS feeds listed here. We take no credit for this article. You can leave a response, or trackback from your own site.